We’re big on Lanterns in home decor here at Craft Warehouse. They can be used in so many ways and for so many seasons. Recently we tried printing out photos on vellum and placing in a lantern and the results actually surprised us. Not only did it look amazing, but it was so easy! This is an awesome idea for a gift or decor for any occasion. Fill with family photos for Christmas and Thanksgiving. Make one for each table for a wedding or anniversary party. Use photos of a child for a graduation party or birthday. You can even print out words or use old vintage images. Lantern (Make sure you grab one that doesn’t have metal across the glass panes). Carefully remove the glass panes from the lantern if possible. Measure the glass panes in the lantern so you know what size to print your images. Display, enjoy and be prepared for compliments. 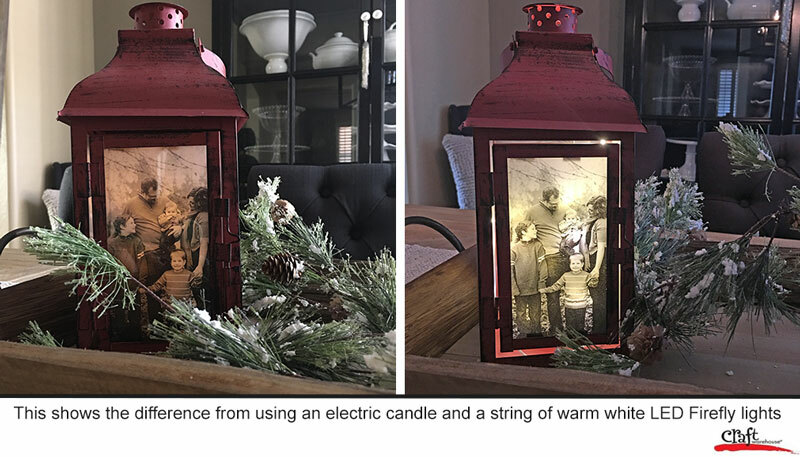 This entry was posted in Christmas Craft Projects, Create, Holiday-Winter, Home Décor, Mother's Day, Valentine's Day, Wedding and tagged Lanterns, photos.